Anon. sale, Hôtel Drouot, Paris, 27 June 1951, lot 46. M. Laffaille and F. Guillon-Laffaille, Raoul Dufy, Catalogue raisonné de l'oeuvre peint, Geneva, 1977, vol. IV, p. 59, no. 1462 (illustrated). Bondues, Château de la Vigne, Collections privées du Nord, September-November 1967, no. 76. Marcq-en-Baroeul, Fondation Anne et Albert Prouvost, Raoul Dufy, March-May 1976, no. 31. Raoul Dufy, the eldest of nine, was born into keenly musical surroundings. His father, Léon-Marius Dufy, was an organist and conductor for church choirs in his spare time, and two of his brothers, Léon and Gaston, were professional musicians. Gaston would later shift to criticism and often supplied Dufy with concert passes. The artist himself was an amateur violinist, but was more interested in attending the symphony than playing. 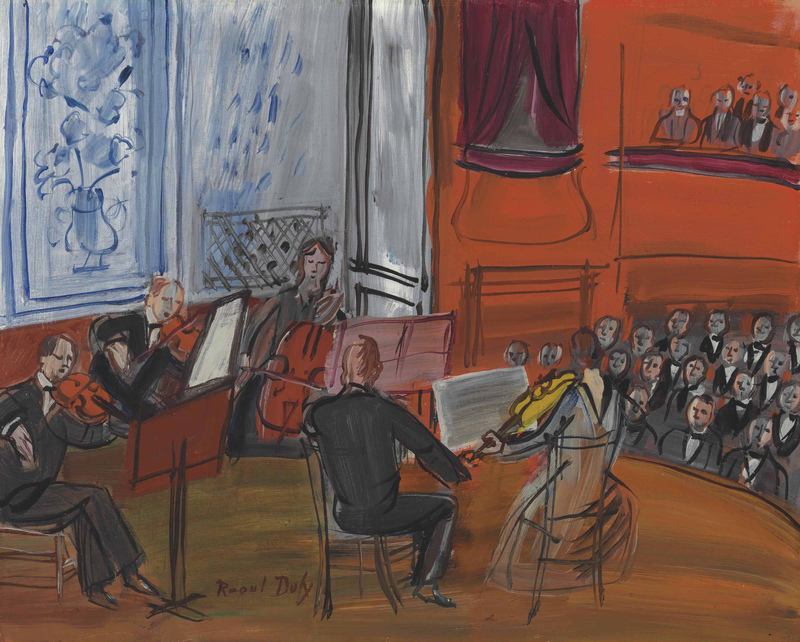 Music featured prominently in Dufy's art, from his first orchestral composition in 1902--L'orchestre du théâtre du Havre (Laffaille, no. 47)--to his later homages to illustrious composers, Wolfgang Amadeus Mozart, Johann Sebastian Bach, Frédéric Chopin and Claude Debussy, among others. Le Quintette is notable for its striking red tonality. In the late phase of his career, Dufy became preoccupied with the phenomenon of tonal painting, in which one color dominates the entire composition. In particular, he espoused this method of painting with his musical subjects, for he felt the richness of one color offered an emotional intensity akin to the effect of harmonic tonality in the compositions of his favorite composers. Of Dufy's sonorous, evocative colors, the celebrated cellist Pablo Casals once said, "I cannot tell what piece your orchestra is playing, but I know which key it is written in" (D. Perez-Tibi, Dufy, New York, 1989, p. 292).